So, a new train timetable starts in June, shaking up the Frankston line in particular, but also the Dandenong line and minor tweaks on some of the other lines. About a year ago I remarked that the Frankston line was using a timetable from the 90s, and little had changed in 15 years. So for the stations between Highett Patterson and Glenhuntly, we’ll have the same number of trains as at present (though Bentleigh loses a couple of expresses). Whereas currently some run express Malvern/Caulfield to South Yarra, from June they’ll all stop all stations to the city. The benefit? They’re more evenly spaced between 7:30 and 8:30, with no ridiculous 16 minute gap between 8:05 and 8:21. The current timetable, from mid-2009, added an 8:09 direct to Flinders St, but this didn’t do the job properly, because being so close after the 8:05, it carries very few people, while the 8:21 is still packed. It’s the uneven gaps between trains that cause some trains to be over-crowded and late, and others to be lightly loaded. Is it enough trains overall to relieve the crowding? I guess we’ll see. The bigger change is almost all the Frankston express trains (which are in addition to those above, because they don’t stop Highett to Glenhuntly inclusive) will run direct to Flinders St, not via the loop. This is to reduce congestion in the Caulfield loop tunnel, and allow some extra Dandenong line trains in. One reason they’ve done this is because in the evening, the current pattern causes overcrowding on the Dandenong trains. This is because Frankston expresses need to leave just before stoppers, so each express can arrive at Caulfield just behind the previous stopper, so they can then overtake on the extra track between Caulfield and Moorabbin. So at the moment because all the Frankston trains need to be run consecutively in the loop, this means you get a gap of 6-8 minutes between Dandenong trains, then 2-3 in a row. Again, uneven frequencies mean some Dandenong trains are much more crowded than others. This change should fix that. But it means people from beyond Cheltenham who are headed for the loop will have to choose whether they get an all stations train to the loop, or get an express but change to/from the loop. Obviously many of them may be able to walk from Flinders Street instead. Bearing in mind of course that Flinders Street isn’t some godforsaken backwater; it’s actually the most popular station. There’s been a shakeup of stopping patterns on the Dandenong line to simplify things. It carries about double the number of passengers of the Frankston line overall — some of the Metro publicity which I can’t find online says 91,000 per day on the Dandy line vs 43,000 Frankston. Because of this the Dandy trains will get to run express through the MATHS stations most of the time (with most Frankston trains outside peak stopping instead). And all their trains will run via the loop. So will the times will be evened out? As I wrote recently, frequencies at Carnegie are currently very uneven. Hmmmm. A bit better. Still some big gaps though. More changes might be needed. Hurstbridge gets some extra trains (as far as Eltham, at least) after the evening peak. Be nice to see this on the other lines too; the shutdown to half-hourly trains after 7pm is pretty hopeless, and does nothing to help spread peak loads around. Alamein/Blackburn trains will move from platform 6 back to platform 4 in peak. 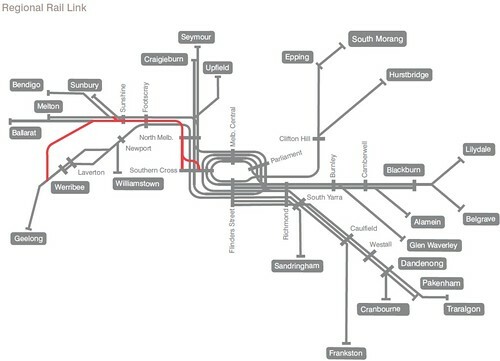 This means Sydenham/Craigieburn/Upfield trains will all squeeze onto platform 5, which may seem counterproductive. Apparently it’s to avoid the Alamein/Blackburn trains clashing with the Dandenong trains on 6/7, which makes sense, but they’ll have to get better at keeping platform 5 running smoothly. At least unlike a few years ago, the Werribees are over on 10. Coolaroo station on the Craigieburn line will open, so some of that line’s times will be adjusted. Minor tweaks on the other lines means it’s worth checking the timetable to see if your train times have changed. All sorts of things — and they’re flagging another change later in the year concentrating on the north/western lines. Peak is still going to be a problem on a lot of lines, with overcrowding and delays. As the rest of the 38 trains arrive, hopefully they’ll help relieve some of the pressure. The Laverton upgrade should be finished soon, which’ll mean more Werribee trains. Off-peak, evening, weekend frequencies all need fixing. This only needs more drivers and maintenance staff. Apparently the maintenance facilities are almost at capacity, but this’ll be relieved when a new one comes online at Craigieburn in 2011. Werribee has its 6 trains per hour between the peaks, and this is where the other lines need to get to, seven days-a-week. Operational stuff like the driver changeover at Flinders Street needs to improve to keep trains pumping through. At some stage I wonder if they’re going to change the loop around a bit. The midday reversal is confusing, and means you can’t get between certain stations at some times of day. In the longer term, what have they got planned? The map below is from the 2008 Victorian Transport Plan (the section “Priority 2: Linking rural, regional and metro Victoria”). Unfortunately most of it’s in monochrome to highlight the Regional Rail Link project, but if you follow the metro lines around you’ll see what they’ve got in mind. Peeking much further into the future, this map shows what’s in mind if/when they build the new rail tunnel under Swanston Street. Essentially the same as above, except that Sunbury/Sydenham will feed into the tunnel, then out to Pakenham and Cranbourne. 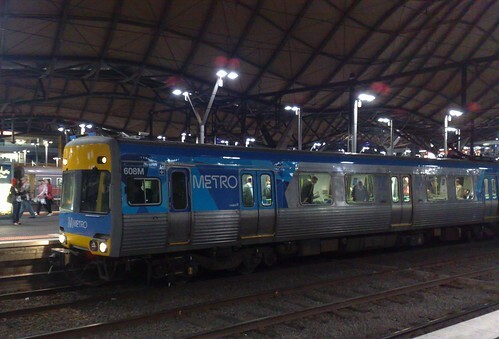 Werribee, Laverton and Williamstown will feed into Flinders Street direct then through to Westall. Frankston will go back into the loop. How crowded is your line? You’ve probably addressed it elsewhere, but is there a good reason why they don’t revive the link between the Upfield lines and the Cragieburn? A corridor is in place already, with the vestiges of the old line. That would definitely take pressure off the latter, which is very busy indeed. Other than that, Upfield shows no change as far as I can tell; still every 20min. I’d be interested to see if it’s been changed in the last 20 years. Thinking about it a bit more, it would depend on how many people actually go to/from Cragieburn itself; it might also congest Cragieburn too much, turning trains around etc. And it might confuse people. Then again, that’s a big growth area… Still, having public transport between that area and down Sydney Rd might be useful. I dunno. Just a thought. It would not be desirable to have suburban trains from Upfield crossing the Melbourne-Sydney standard gauge at Somerton/Roxburgh Park where the disused section of line joins up with the Craigieburn line. So it would involve a flyover with the Upfield lind over the standard gauge like at Jacana (very unlikely) or a third dead end platform at Roxburgh Park for trains via Upfield, located on the opposide side of the SG line. I guess it would be useful in terms of providing a little redundancy to the train lines north of one is out of action. My guess is it won’t happen any time soon. Thanks for the explanation, Andrew S. I was unaware of the crossing issue. im still frustrated that the belgrave line still has some strange wait times. if someone were to miss the city bound 8:04, they have to wait 27 minutes for the 8:31 (times departing belgrave), and during the day, outbound trains run at frustrating 30 minute intervals, and often have quite a few people on them due to this. Is it that hard to have trains at 15 minute intervals right throughout the day on belgrave, lilydale and alamein lines? this would mean that within any 5 minute period, there would be only 1 train in each direction until camberwell, which seems manageable to me. I guess the 8:04 is intended to be the end of peak hour, since it arrives in the city after 9am. 2) Ferntree Gully to Belgrave is single track, and according to trip planner it takes 13 minutes to go between them. Upper Ferntree Gully, Upwey and Belgrave stations have 2 platforms, which would allow for overtaking, so it should be able to be done …… Unless there is some strange rule i dont know about regarding number of trains that can be past Ferntree Gully at one time. this makes me think about how complicated the metro timetabler’s job would be, and how they manage to get trains where they need them to run the services. Re: the single track from Ferntree Gully to Belgrave; because there are multiple sections of single track, equally spaced at 5 minutes, if all trains are exactly on-time then you can run six trains each way each hour (i.e. 60/5 = 12, 12/2 directions = 6). However, if any one of those trains is even slightly late while on the single track, the whole thing goes to hell. On top of that, if a train approaching Ferntre Gully toards Melbourne runs late enough to cause even a few seconds of delay to the opposing Belgrave train, that Belgrave train will be held at the signal before Ferntree Gully’s platform (called L1119) for two minutes, causing the delays to cascade. Further, there is a restricition at the Belgrave end of Ferntree Gully because of the proximity of the points to the level crossing. In theory the boom barriers are supposed to rise, wait 25 (?) seconds and then drop between trains. In practice, because of the ancient technology (which takes whole seconds to activate), if the Upper Gully signalman is lucky he can switch the points at Ferntree Gully before the boom barriers rise to avoid the worst of two-minute delay. However, there is only a few seconds in which this is possible. A manual fix to this would be to have a “hold” button to keep the Ferntree Gully boom barriers down, but if this were left in place mistakenly it would cause traffic chaos. Upwey and Belgrave are both designed to allow trains to arrive and depart simultaneously, and generally the timetables are dependant on this. Why can’t peak intervals be even? Certainly they used to be on Sandringham line, although not now. Looking at your Carnegie times from 8 til 9. 6 min, 4, 3, 9, 3. Is this because every last bit is been squeezed from the drivers and the trains? That is, it is more costly to run an even service. You know what really annoyed me when I was down last week? The new Footscray station! The old Footscray station was great – the ramps were easy to use with a pram, and all the important walkways had textured cues for blind people to feel with their feet or a cane (I could get from platform 2 or 4 to the bus with a blindfold on and no cane just by feeling the texture cues through my shoes – it was that good). Now they’ve made the layout confusing, failed to put in non-visual navigation cues and taken away the ramps. Using the lift with a pram is slow and annoying, and I wouldn’t be confident to try navigating it blindfolded without some other aids. Glad to see they aren’t slipping these “extra services” outside the peak as some sort of victory. Still, it’ll take more than a bit of nugget to polish this turd! The North Coburg tram line should close down to create more patronage on the Campbellfield railway line and more patronage means every 10-15 mins and new timetables. I notice that under the new timetable thy are “discouraging” people from changing from the Frankston express trains at Richmond to city loop services and are instead encouraging passengers to go to flinders street and take trams. For passengers headed to workplaces near city loop stations, this will eat up the entire 10 minute advantage of taking an express train. As for the evening peak, how many people are going to get on a frankston all stations train in the loop and then switch to an express at richmond in the hope that it will overtake the train they were previously on? I think people would rather not risk it, and keep their seat rather than entering into a game of musical chairs with an express train that may never come and may never make it to the overtaking point in time. I think this new timetable is going to be a disaster on the Frankston line; the stopping trains will be fuller than ever and the expresses will stop being used. So Metro will get what they said they want: the end to all express trains. Why can’t the track arrangements be reconfigured to allow for cross-platform interchange between city loop/direct/express/stopping services at richmond, as it is for L/B/A/GW passengers? Why can’t Richmond 3/4 be for the down trains and 5/6 be for the up trains. There are enough crossing points at Caulfield to achieve this arrangement for all trains coming in from Frankston and Cranbourne/pakenham. I would think this would significantly reduce scope for delays. Shutting down the tram would just make the trains more crowded; how is that a good idea? Vas. It will also sooth the road congestion on sydney road. Phillip’s idea seems to assume that Sydney Road shops themselves are not a destination for tram passengers. While the Upfield line is used for longer distance trips, a lot of people are making shorter trips on the trams. Hint: You don’t cut traffic congestion by simultaneously cutting trams and giving more space to cars, thus making it harder to use PT, and easier for people to drive. Vas the Man is spot on re Footscray station – the amenity of the station has deteriorated appallingly. The station is next to Footscray market and the number of granny trolleys (my wife and I use one as it is a highly effective way to market shop) is large. a couple of months ago it was easy to use the ramps to access the market and change platforms. Now you need to use the lifts or become Hercules to move your shopping. As I have mountain goat blood in my veins, I find the steep stairs easy to use especially at non-peak times, however, for the rest of humanity it must e extremely difficult. The designers must be applauded for an aesthetically pleasing but non-functional waste of money. Phllip, are you for real, or are you just a troll? You seem to have a habit of tossing inflammatory one-liners into a debate, and I can’t help thinking you’re doing it just to get a reaction rather than trying to contribute anything useful. However, I’ll give you the benefit of the doubt. Closing the North Coburg tram line makes no sense at all. Partly for the reason Daniel mentioned – that the Sydney Rd shops are a destination in themselves, and shoppers prefer trams that stop every few blocks rather than trains that only stop every kilometre or so. But the main reason that closing the No. 19 tram line is a silly idea is that the Upfield train is of very little use to anyone travelling from the Brunswick/Coburg/North Coburg area whose destination is south of Brunswick Road and north of Franklin St. For instance, people travelling to Melbourne Uni, or its colleges, or Monash Parkville, or Royal Melbourne Hospital, or University High School, or Queensberry St, or the Victoria Market. The No. 19 tram goes right past all these places, and is very heavily patronised. I should know. I use it every day. The Upfield train line veers off to the west at Brunswick Road and skirts around Royal Park and Flemington. It goes nowhere near any of the places I have listed above. You seem to be assuming that everyone who uses the No. 19 tram goes all the way into the city and therefore it would make no difference if all its passengers took the train instead. Not so. If the No. 19 disappeared and I were forced to take the train, I’d have to exit at either North Melbourne, and take a bus the rest of the way, or at Melb Central and take a tram. Either way it would more than double my commuting time. And if your justification for such a proposal is that it would improve traffic flow on Sydney Road – well, that’s no reason at all as far as I’m concerned. Are there any train stations that have been improved by a renovation? Footscray – haven’t seen it yet but getting rid of the ramps was always going to be bad. Museum/Melb Central – used to be a great, efficient layout, now it is useless, with the express escelators not used and everyone forced to squeeze past shops. The ramps at North Melbourne are staying. Perhaps this was the mistake made at Footscray; old ramps may not be DDA-compliant, but they don’t break down/get vandalised like lifts do, and can be used by more people than stairs. Spencer St/Southern Cross — I wonder if people might have forgotten what a hole the old station was. Mind you, it does take longer to get in and out of the place than it used to. It may have been a hole, but you didn’t have to breath diesel fumes and it didn’t require artificial lighting all day. Standing in the rain was better. My initial excitement at the announcement of additional peak time services on the Frankston line was quickly dashed when I read the timetable. There’s effectively no additional services to alleviate the volume of commuters. Plus making the express services terminate at Flinders Street doesn’t assist Frankston line passengers to get into/from work any faster at all, as most cbd workers (peak services) need to get off/on a loop station. So now I choose between changing at Richmond (which is discouraged in the new brochures because of the congestion), or walking from Flinders to Parliament, which adds at least 10 minutes to my time. Otherwise I take a train stopping all stations. How does this assist any commuters living from Cheltenham to Frankston reduce their train trip times? Daniel you’ve explained this curious timetable as a way of freeing up Caulfield and the loop for the Dandenong line trains. So Frankston line passengers aren’t actually any better off. Dandenong line may have more passengers, but it also already has many more services. In the evenings twice as many trains arrive in quick succession on the Dandenong line, with the later ones being empty, while for the Frankston line we are waiting at least 10 minutes in peak times for another train (often 15mins). And by the time our train reaches Parliament station commuters have to cram in the doorway to get on. This is made worse because Frankston line generally stops South Yarra to Malvern, when a number of Dandenong line trains will travel express during the same period. 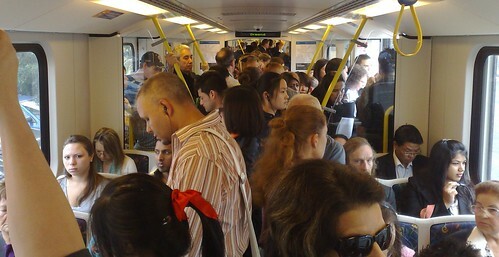 The Frankston line is a very congested line in terms of number of stops and by the time it reaches Mordialloc in the morning peak commuters are standing. Currently I have the choice of standing on an express train for 40 mins or sitting on a train that takes an hour to get me to work. At least when I’ve used the Dandenong line train there are so many more services at both peak times that standing or length of travel is not an issue. Surely another consideration should be the length of the line and number of stops, in which case the Frankston line has more stops than the Dandenong line. For Frankston line, why not have some trains running express from Mordialloc to the City and have some commencing from Mordialloc, rather than running the full line? And mix up the express from South Yarra to Malvern with the Dandenong line, where there are twice as many services in the first place and less stops. Some very valid points there Belinda. I think the warnings about changing at Richmond are probably a little over-alarmist. It’s true that it would be a problem if 3/4 of the train piled out looking to go round the loop, but I think once it settles down, people within 2-3 blocks of FSS will just stay on the train (even if they’ve previously used the loop stations) and walk/catch a tram; it’ll be quicker. Look at the Sandringham line; perhaps a third of people change trains at Richmond. It’s true, the Dandenong line has taken priority over the Frankstons. Remember, they do have twice as many users on that line, so I think that’s probably justified. The line lengths (when you count CBD to Pakenham or Cranbourne) are about the same as Frankston – a bit more than an hour end-to-end. But yes, it’s going to cause longer trips for some people on the Frankston line. Express all the way from Mordialloc to Caulfield probably isn’t practical, because the more stations skipped, the more track capacity is taken, so the less trains can run overall. I understand a bunch of modelling has been done and they really believe this change will even out the train loads and improve reliability. If it doesn’t though, people will be entitled to demand to know why. Station renovations: Nunawading – some improvement overall, but they don’t have ramps for the wheelies and prams. And if the power fails, getting the wheelies out would be very problematic. Also a problem at the new Nunawading: when train drivers to Ringwood tap their horn, it is really LOUD, because of the closed in nature of the station at the eastern end. The morining Frankston line will be a disaster. The expresses will have plenty of room, the stoppers packed, and no-one after Bentleigh will get on. The reason that expresses now stop at Bentleigh, is to even out loads & allow downstream passengers to get on. Why is the same mistake being made yet again? I predict that expresses will be stopping again with 6 months. Daniel, I cant believe how you support a 30% reduction is services from Bentleigh, and allow this government to advertise on my TV that they are increasing services…. Bentleigh is unusual because of those extra expresses, yeah. Don’t get me wrong; I catch the train from Bentleigh, and love the expresses when I catch them. But the punctuality and crowding is far more important to fix, and the way they’ve been added means they come through a couple of minutes after stopping trains, leaving big gaps. So basically the two expresses disappear, and everything else gets re-arranged, mostly at much more even frequency, with a train every 8-9 minutes for the height of the peak, though they’ll all stop all stations. There’s still some big gaps before and after the peak that may be problematic. I think those coming in from Cheltenham and beyond will have to think about where they’re really headed in the city. Remember, Flinders St is the most popular station now, and just as close as Melbourne Central if you work in Bourke St, say. I’ve had one person who travels to Melb Uni say they’d change at Richmond for a loop train, then again to a tram at Melbourne Central. They and others would do better to change at Flinders St instead of Melb Central (esp as the exit from the latter is so torturous). So the demand for loop trains may not be as high as one assumes. What Metro are claiming is that this will make a big improvement in reliability and crowding (the Frankston line is one of the worst right now). And they claim to have done the surveys and modelling to prove it. Certainly if we don’t see a big improvement, I hope and expect people to be pounding on their local MPs’ doors and making a fuss about it. As for those bloody TV ads, what a huge waste of taxpayers’ money they are. The station assistant making announcements at Bentleigh and handing out timetables has done way more for awareness of the changes coming than those adverts. Well, tomorrow is the BIG day on the Frankston (Frankenstein) line. I come into Flagstaff from Carrum and because there are no express trains through the loop will now have to leave home even earlier and will get home later – probably an extra 15 mins at either end of the day. That will mean I will now travel a total of 3 hours each day, and that’s just from Carrum. Pity the poor sods who drive up to Frankston from the Peninsula – seems to me the new timetable was designed by someone who lives close to the city. There’s been total disregard for the amount of time people have to travel. Would’ve made much more sense to me to make the stopping trains go direct to Flinders Street. Most of the passengers on the express train I’ve been travelling on get off at loop stations, so there’ll be chaos at Richmond at either end of the day. And going to Flinders Street and tramming it doesn’t even come into the equation. This is a real backwards step IMHO.